What better way is there to experience a country’s culture than by savoring its authentic cuisine? Fortunately for guests at Grand Fiesta American Coral Beach Cancun, La Joya Restaurant offers the “real deal,” when it comes to Mexican food and it’s dished up in an authentic setting, so you can actually “feel” the country – its ambiente. While thoughts of Mexican food typically conjure up visions of spicy salsa, tangy tacos and soggy burritos stuffed with or topped by suspicious-looking sauces and shredded cheeses, Mexican food is nothing like that. Our chefs’ keen awareness of Mexican flavors, combined with their flair for haute cuisine, results in a vibrant blend of delectable flavors – showcased by a truly unique presentation of the dishes served. 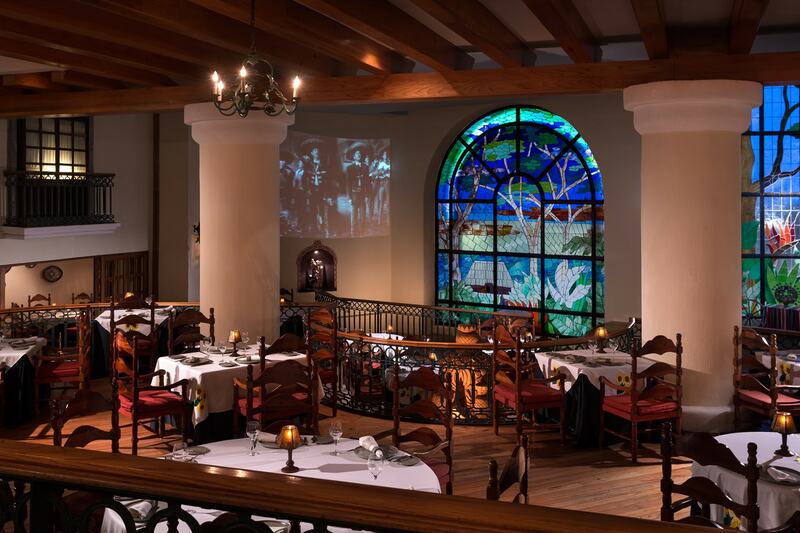 Not only are diners in this chic Latin restaurant treated to a varied menu highlighting traditional favorites, along with signature “nouvelle cuisine” choices and typical beverages, they’re treated to music, entertainment – and even movies from Mexico’s Golden Age. Kick start your dining experience with a delicious lobster pozole with green pumpkin seed, corn grains and radishes, or the tangy tortilla soup made with corn tortillas, panela cheese, cream, coriander, avocado and “pasilla” chiles. Salads – such cactus leaf served with beans, grilled spring onions, cheese, roasted grasshoppers from Oaxaca, with oregano and pepper vinaigrette – set the stage for the gastronomic adventure. Culinary treats, sure to please the most discerning palate include popular choices such as the classic beef fillet “Tampiqueña” with Mexican rice, guacamole, tender corn, charro beans and Poblano chile; or chicken in mole sauce accompanied by rice, fried plantain and pumpkin sesame seeds, smothered in Oaxaca black mole sauce. For seafood lovers, choices can include grouper ‘Pastor’ style, marinated with annatto seed, guajillo chili and sour orange, served with pineapple, onion and a tasty coriander purée; or Chilean sea bass wrapped with Mexican pepper leaf, served with roasted tomatillos, citrus foam and asparagus. As you would expect, a selection of delicious desserts such as flan and other treats provide the prefect finale, along with a steaming café de olla and other coffee and tea selections. The dining experience is enhanced by tequila tastings, which include an overview of how it’s made along with an explanation – and sampling – of the different varieties, accompanied of course, by lime and salt. Wednesdays from 6:30 – 11 p.m. guests can experience an authentic Mexican fiesta with colorful entertainment including a colorful folkloric show and mariachis offering stirring renditions of longtime Mexican musical favorites.